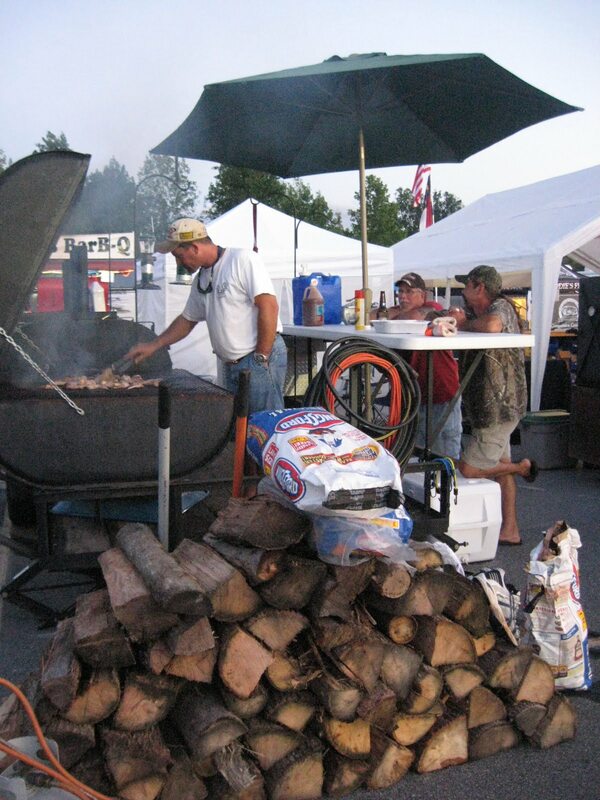 Salisbury, North Carolina is a barbecue town, but it's not been a BBQ competition town. We've had a couple of small comps but not much to write or call home about. So, I had been looking forward to Biker Blues & BBQ at Tilley Harley Davidson. After work today, I headed over to see how Salisbury would do with a circuit barbecue competition. I was greeted in the parking lot by a guy with a brochure. I was pretty sure he was going to shake me down for a few bucks to park, but he didn't. Parking was free, and they even had the golf cart taxis to haul us up one block to Tilley's. Hey now, you can't beat that. I went looking for Darrin and Donna Vasseur. 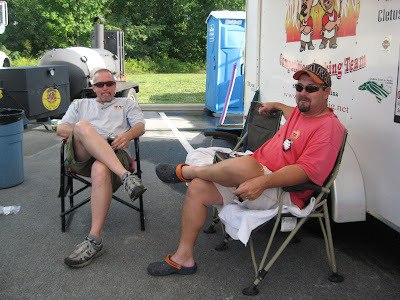 We are friends on Facebook, and they were out for their first barbecue competition. Our golf cart taxi driver took us around back where there were more vendors and the teams and helped us look for D&D. We hopped off right beside them and finally got to meet face to face. Last night was a gully washer, but Darrin and Donna had weathered it well along with Bella - their rescue dog who was enjoying the heck out of the barbecue comp. The rain had put a dent in the canopy, but the trailor borrowed from a friend who races dirt bikes was dry and ready for the big prep. Donna was doing something with parsley. 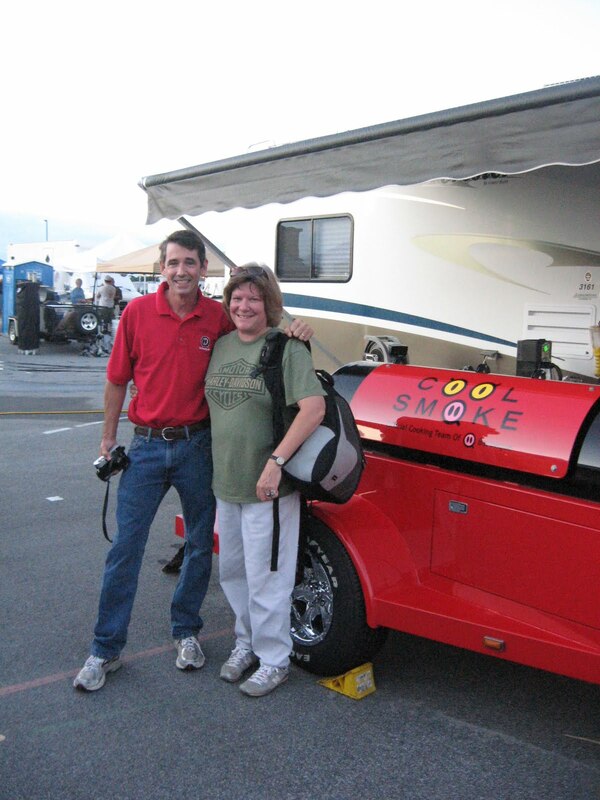 I won't say what she was doing, since that might just be one of those barbecue competition secrets. It was cool to watch though, and I might parsley up something here soon. 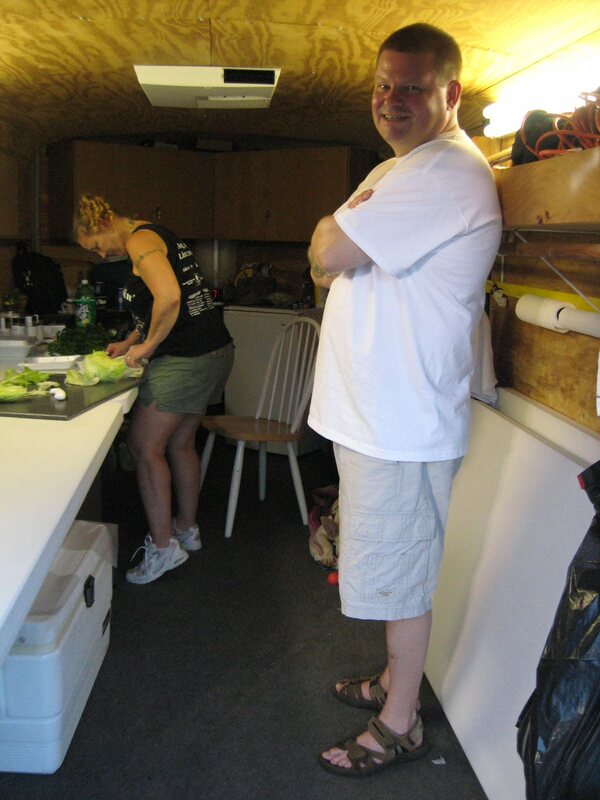 I wandered on down the line of campers, and I must say that barbecue cooking must pay better than barbecue writing, since some of those rigs were fancier than my house. Down at the end of the row I found Pig Pen. I've been wanting to meet him. I bought his seasoning at Food Lion, and then I got my reading glasses out (Argh - hate not being able to see well now) and noticed that he is local. I've been enjoying the heck out of his seasoning, and he gave me a bottle of his new Pig Pen hot mix which I can't wait to try out. Jimmy told me that Tuffy Stone was taking photos. 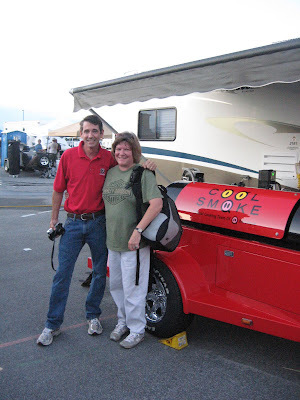 He's been on BBQ Pitmasters, and he's on my Facebook friend list too. I looked closer, and . . . yes . . . that was Tuffy Stone. I went over to chat with Tuffy and got my photo made. I don't guess I've tried to get a TV star photo since I was about 12 years old and was at Tweetsie Railroad and had my photo with Jody from Family Affair (a TV show - dating myself for sure now). I was so nervous that time that I sat about 6 feet away from Jody, so I did much better this time. Tuffy was very easy to talk to, and I managed to stay in the photo frame. Before we headed off for the night, I wanted to get some pork skins. Before you say, "Oh gross," you really must try them. Pork skins (or good ones) are light and airy and kind of like chips but not really and much better. The Yadkin River Smokers out of Lexington had the pork skins spot on. They were making them right there at the competition. I had a hard time deciding which flavor to get but went with the plain ones. Fabulous. I am munching as I type, and since this computer is about to give up the ghost, well . . . no problem with crumbs. Robert gave me a bottle of their barbecue sauce too. It's a North Carolina western - vinegar with some red (tomato) and a little more sugar than typical. Robert suggested that I heat some and use it as a dip with grilled chicken, so that's on my list to check out soon. We were hitting it off great with Yadkin River Smokers, and they gave us cupcakes by The Cake Plate from Winston Salem too. Yum. The key lime frosting was terrific. I was also impressed with the really cool pig cake that they had on display. Perfect way to end a night on a sweet note. The Tilley Harley-Davidson barbecue competition was really solid. We enjoyed the evening, and I think we will drop back tomorrow. The food was yummy. 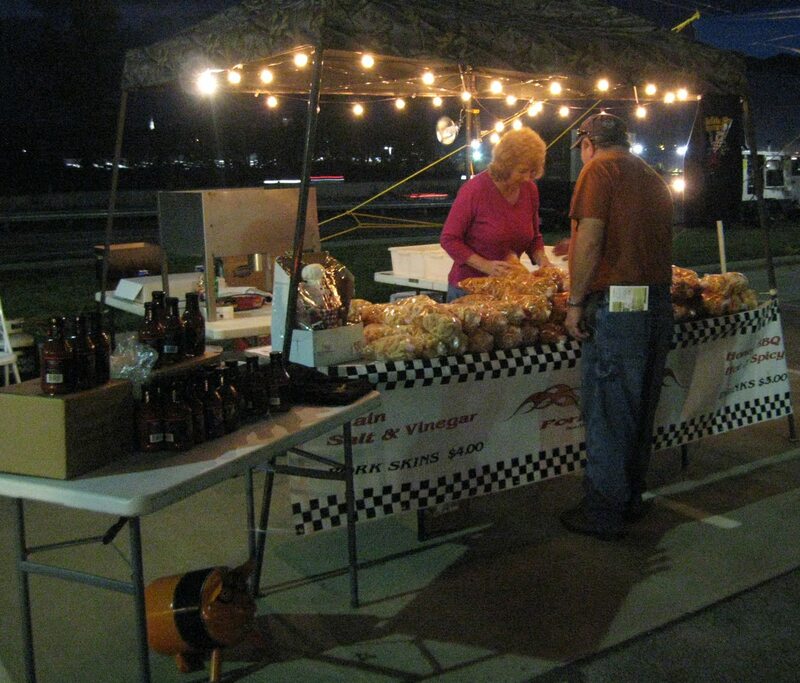 We had wings and French fries by TGIF and listened to some great blues music. I tried some wine from Old Stone Winery of Salisbury, and it was so good that I bought a bottle of the peach wine for a birthday gift coming up. I may have to get another when we go back. It was an all round great time, and I'm glad I went out. I guess I better wrap up here soon, so I can drop by tomorrow and see the winners. But, I must say they are all winners. Just a great bunch of folks and a really nice barbecue gathering. Enjoy some Biker Blues & BBQ photos from Friday evening that I posted on Facebook and a large collection of competition BBQ photos from judgement day. Thank you so much for all your publicity. Let me know how you like the sauce. Hope to have BBQ for friends. Will let you know. I wish I could've made it to this competition. I was slated as an alternate but had to back out. Sounds like a first-class competition! Yes. Mostly. They are not too cool with new media though. Think they don't need to street news folks I guess.